Archaeologists have found a 400-year-old shipwreck off the coast of Portugal, in what one specialist called the "discovery of a decade". Spices, ceramics and cannons engraved with Portugal's coat of arms all lie around the wreck, found near Cascais, close to the capital Lisbon. This was at the height of Portugal's spice trade with Asia. Who owns treasure hidden under the sea? At a depth of 12m (40ft) the wreck was very well preserved, project director Jorge Freire told Reuters news agency. "From a heritage perspective, this is the discovery of the decade," he said, calling it "the most important find of all time" for the country. 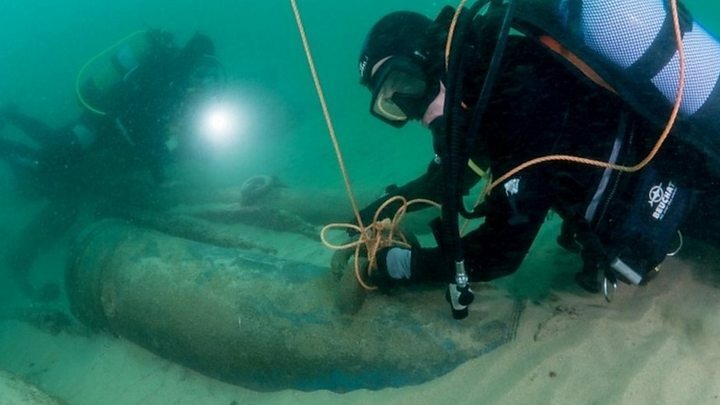 Image caption The project's head called the wreck "very well-preserved"
Chinese porcelain from the late 16th and early 17th centuries was also among the wreck, as were bronze artillery pieces and cowry shells - a currency used in the slave trade. Mayor Carlos Carreiras told the Guardian newspaper it was an "extraordinary discovery", which will reinforce their "collective identity and shared values". The Minister of Culture, Luis Mendes, said the mouth of the Tagus river was considered a "hotspot" for wrecks. "This discovery came to prove it," he said.